How the Finnish capital became the next great European dining destination. That sort of extreme modesty is deeply baked into Finnish culture—there are dozens of stories and multiple videos on the supposed humbleness of Finns—but the question of why to go now sounds outright comical if you look at what’s happening in the city’s dining scene. Over the past few years, Helsinki has seen an extraordinary culinary boom, as a slew of diverse, travel-worthy new restaurants set a new standard. Spurred by a sharply rising economy that recently jumped out of a years-long recession and an urban culture that is increasingly interested dining out, a new generation of Finnish chefs is elevating the capital city’s dining scene. Many young restaurateurs driving this surge had gone abroad to expand their culinary knowledge and have since come home, melding their international experiences with a uniquely Finnish take that includes fermented foods, surprising vegan options, and a strong environmentalist ethos. Mikkola is one of those recent returns. 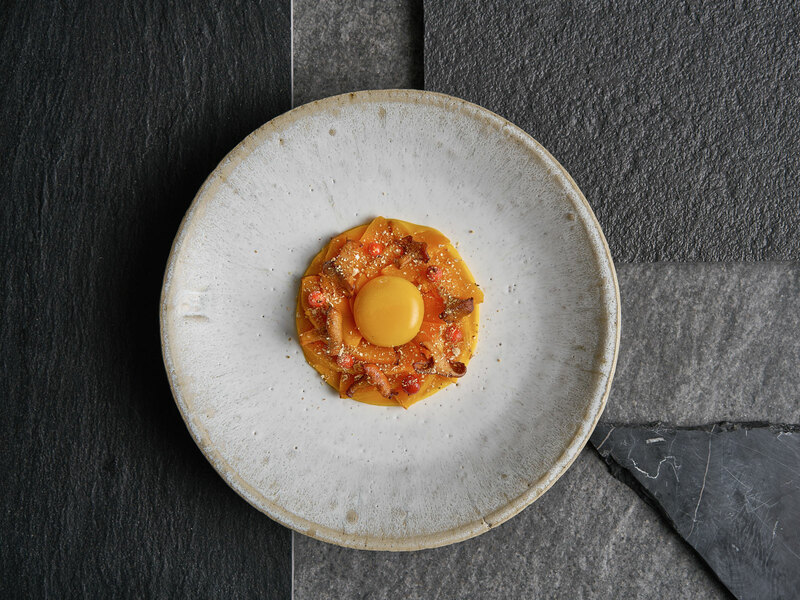 Last summer, he and his Korean-American wife, Evelyn Kim—who he met working at Noma—opened Inari in a stark, candlelit space offering a tasting menu that seems destined for a Michelin star. Feeling a slight shift in his hometown’s restaurant scene, Mikkola decided it was time to leave the big internationally acclaimed restaurants and return home to find his voice. “I felt that if I didn't give back to Helsinki and show the young kids you could do it without big backers, I’d be doing something wrong,” he says. Mikkola and Kim cook locally-sourced produce using pan-Asian flavors and techniques, serving dishes like tomatoes scented with Szechuan peppercorns and mint, rice cakes topped with roe in a mussel broth, and scallion pancakes alongside Korean-style condiments. Though the chefs insist they are merely cooking the sort of food they’d serve at their own dinner parties, they allow that the concept nods to Finland’s current and historical connections to the east. The country’s capital city was transferred from Turku to Helsinki by the Russians in 1812 after they took the country from the Swedes in a bloody war. Just over a century later, when Finland declared independence from Russia, Japan was one of the first countries to diplomatically recognize Finland in 1919. And Finland was one of the first Western countries to establish diplomatic relations with the People's Republic of China in 1950. That mutual respect and admiration exist to this day and the country has been working toward deepening ties with other Asian countries, as well. Because of frequent direct Finnair flights, Helsinki has seen a recent surge in tourists from China and Japan. Americans are starting to notice the changes as well, with U.S. visitation up 16%. Finland is so vegetarian-friendly (second place in Europe) that it’s where McDonald’s decided the test its vegan burger last year. “Up until a few decades ago Finland was way poorer than it’s Nordic neighbors, so with that and the long stark winters, there’s a strong tradition of pickling, fermenting, using ingredients to the very last bit,” says Kaarina Gould, executive director of the Finnish Cultural Institute in New York. While Helsinki’s New Nordic or New Finnish concepts have been attracting global acclaim—all five of its Michelin star recipients reimagine the nation’s cuisine in one way or another—there is an exciting class of newcomers honoring Finnish culture more abstractly. Way Bakery & Wine Bar, opened in September by the owners of Michelin-starred Grön, is a daytime coffee shop and evening natural wine bar serving interesting organic fare from breakfast through dinner. It pulls influences from the Mediterranean with anchovies, olive oil, and imported cheeses, but does so through Finland’s sustainable, vegetable-centric tradition. 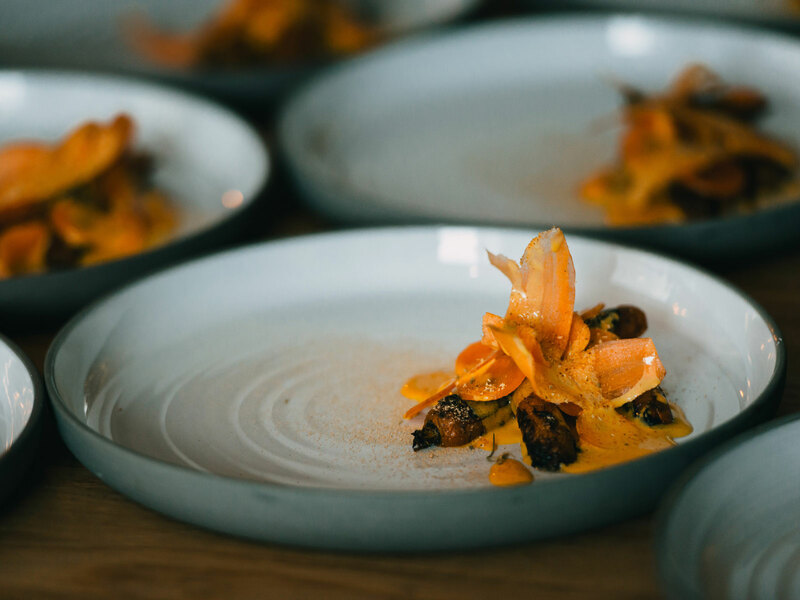 That environmentally-friendly mindset has become a driver in Helsinki’s dining scene at new tasting menu concepts like Ultima. Chefs Henri Alén and Tommi Tuominen are experimenting with bringing the circular economy, a regenerative system that aims to minimize waste, to the restaurant world. Exploring the possibilities of engineering, they grow 500 different herbs, algae, and the crickets they use in their tacos onsite in an attempt to reduce packaging and other resources. Wanting to highlight Finland’s environmentally-friendly ethos and its evolving culture, last spring Gould helped to create Zero Waste Bistro, a pop-up of Helsinki’s Restaurant Nolla for WantedDesign Manhattan. The concept, which was designed with recycled materials every step of the way and no garbage can whatsoever, was founded by three hospitality vets from Southern Europe who settled in Helsinki. Like the city’s leaders in New Finnish cuisine, the Nolla crew use Finnish produce and animal proteins, but with a focus on by-products like spent grains from local breweries. Male sturgeon, which would normally be tossed aside by the caviar industry, is one example. Drawing from his Spanish heritage, chef Albert Franch Sunyer will sometimes prepare it escabeche (cooked in vinegar) with a chile-infused pil-pil sauce, a riff on a traditional Basque dish. That growing excitement among locals and tourists is lifting all boats in Helsinki’s culinary world, attracting residents and tourists to new and established restaurants, helping the farmers that grow the food and filling in the gaps in different styles of cuisine.